What comes to your mind when you think of Belgium? Waffles? Beer? The EU headquarters? Add the movie “In Bruges” and chocolate, and you will pretty much get the image an average person has about this Western European country. 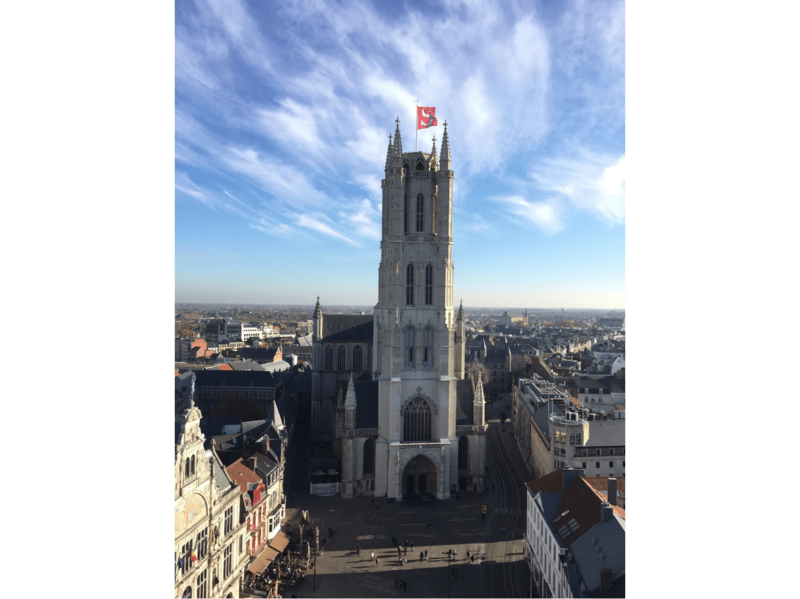 My short visit to Brussels and Bruges this May ’18 didn’t quite help get a better understanding of the Belgian culture. Well, if only with the fact that Manneken Pis is indeed a joke. …and then I came to Ghent. Um, Ghent? What is it about? Ghent is the capital of East Flanders. In the scale of miniature Belgium, it boasts the population of around 250,000 inhabitants and is the biggest city in the province. 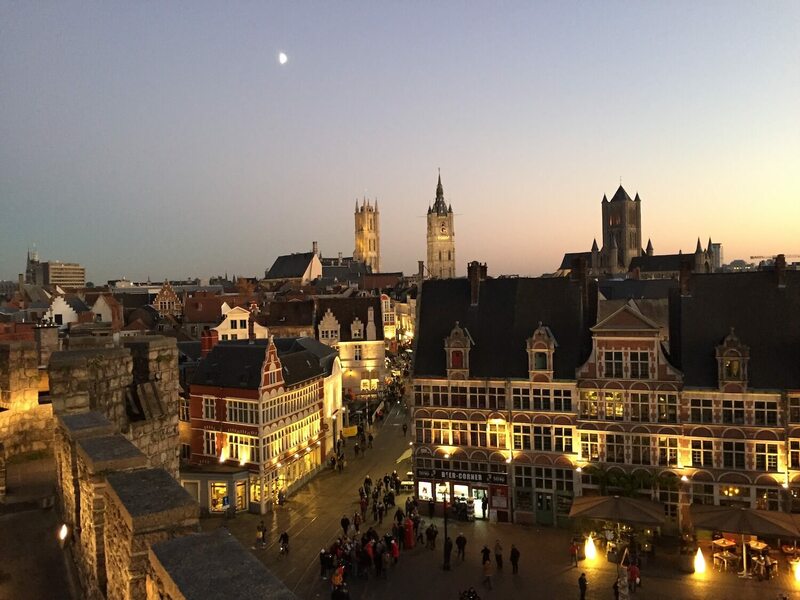 As the guidebook states poetically, ‘Ghent first saw the light of day in 630’. The city has quite a fascinating history. At some point, it was second in size only to Paris, trading wool and enjoying itself. 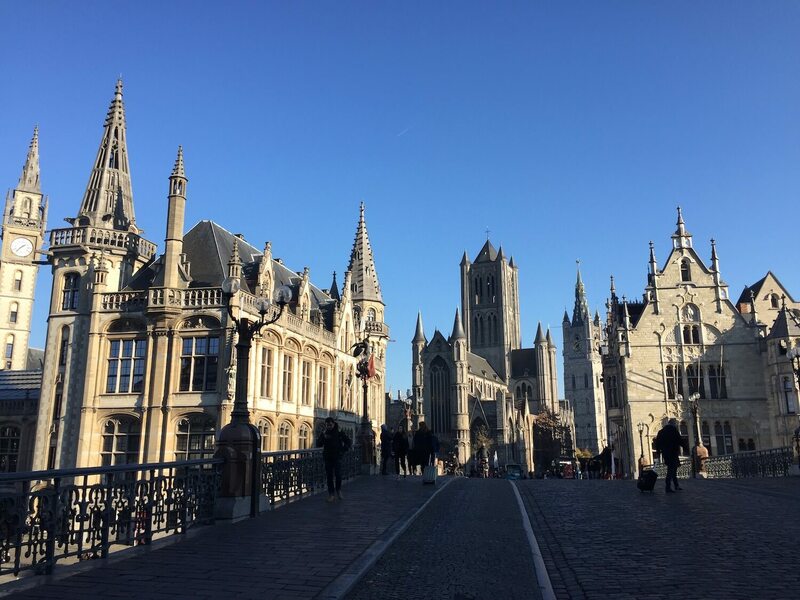 However, somewhere in the 1500s, Ghent rebelled against its own Emperor Charles V, refused to pay taxes and hence was banned from the Medieval political scene. In the 19th century, Ghent became the cradle of trade unions and socialist movements, with the Vooruit building as their headquarters. During World War II, it was occupied by Nazi Germany and liberated by the British in September 1944. No story about Ghent could possibly avoid mentioning all its magnificent cathedrals, squares, towers, and canals. The city bursts with Medieval treasures, luring tourists like myself to its cobbled streets. Most people probably only come here on day tours from Brussels or other nearby cities. However, after spending a weekend in Ghent, I can only recommend that you dedicate a little more time to it. Because I personally couldn’t get enough. The little guidebook that I got from my Airbnb hosts says that this cathedral is the oldest parish church in Ghent. It stands on the site of the 10th-century church (just to give you an idea of how old the city is!) and is probably best known for its Altarpiece — the Adoration of the Mystic Lamb by the van Eyck brothers. 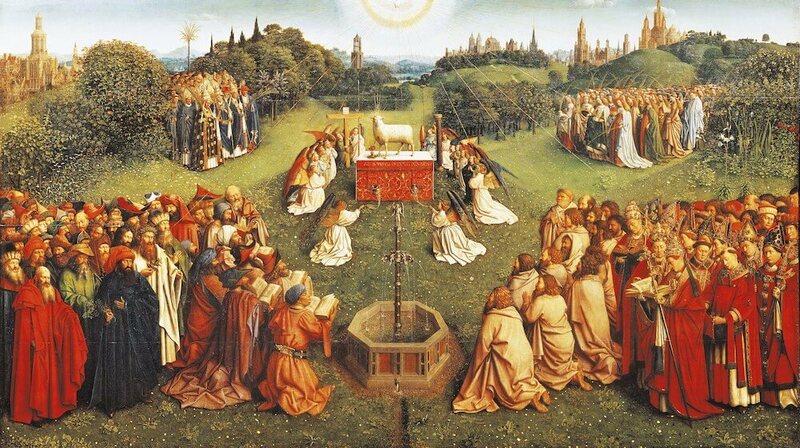 To enjoy the mysticism of the Altarpiece, you’ll have to pay 8 euro. And probably also come at dawn or something: it’s stored in a tiny room in the cathedral and is naturally swarming with people. Since I wasn’t in the mood to fight my way to the very front, the famous van Eyck masterpiece was obstructed by the heads of Spanish, German and French tourists. So here’s a picture from Dr. Google for you instead. The belfry of Ghent, like its counterparts in other regions of Flanders and France, was “the ultimate symbol of freedom and independence”. In the medieval times, it used to be the safest place in the city, so all the goodies like the city’s archives were kept there. Today, the 91-meter tower (there’s an elevator!) 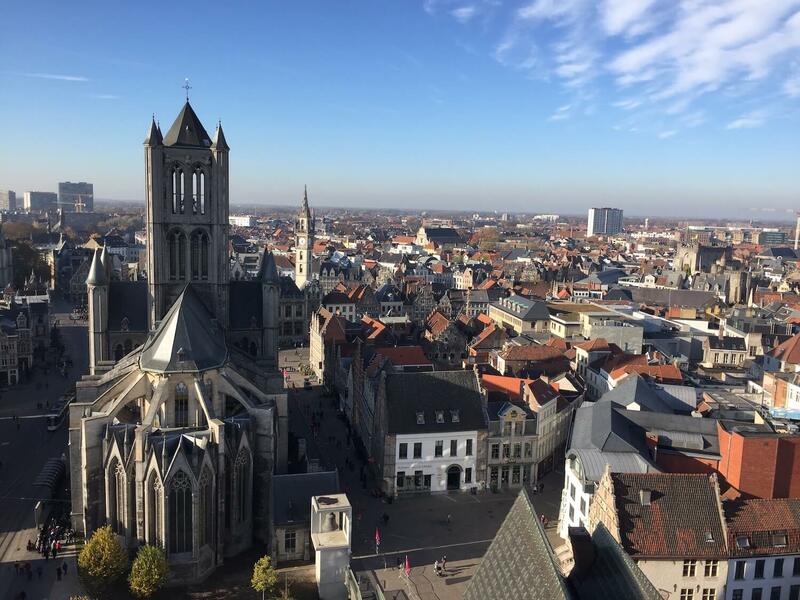 is a perfect spot to observe the historic center of Ghent. Totally worth a visit. Graslei & Korenlei are quays along the Lys river. In the old times, they used to host the city’s trading activities which later led to the place turning into a port. Nowadays, they are full of locals, tourists, and students enjoying beer and relaxing in the sun. Making me wish to become a Ghent student, too, for once! There’s plenty of cafes and bars around, too, giving you an opportunity to chill out with some comfort. The boat tour station is also nearby, in case you want to discover the city from the water. Aka Sint-Michielsbrug, this is probably the most romantic place in Ghent. Also, the best spot to take postcard-like pictures. Crossing from the side of St. Michael’s church, enjoy the views of the historic center opening up to you. A total fairytale. As if all the open-work cathedrals weren’t enough, Ghent also has its very own castle — Gravensteen (the Castle of the Counts). It is about the only remaining medieval fortress in Flanders, with its history dating back to the Roman occupation. To be totally fair, seems like the castle hasn’t really survived to this day in its original splendor: it was rebuilt and renovated quite heavily. Nevertheless, it is still a major tourist attraction. For starters, it has a unique collection of torture equipment! The admission for non-Belgians is 10 euros. Despite its charming beauty and over-touristy looks, Ghent still manages to keep its intimate atmosphere. It feels lively and full of energy, what with having the largest student population in Belgium. Despite its charming beauty and over-touristy looks, Ghent still manages to keep its intimate atmosphere. Once I heard a story about an American tourist who, when visiting Bruges, asked when it closes down as if it were a museum. I can’t really blame him: the city did feel somewhat artificial. Being similar to Bruges in style and architecture, Ghent couldn’t feel more alive. And this energy is what makes the city such a charming place. 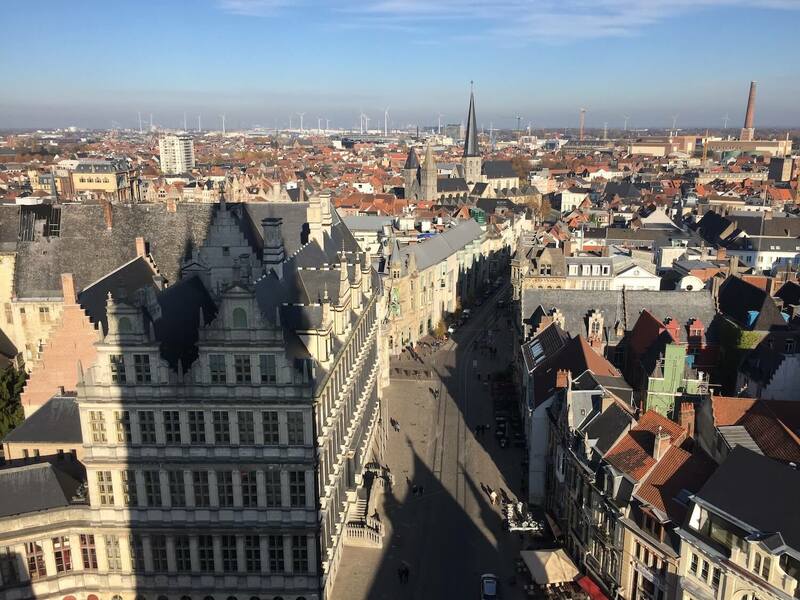 So, once you’ve called it a day with visiting the sights, what is there to do in Ghent? Here’s a story for you. 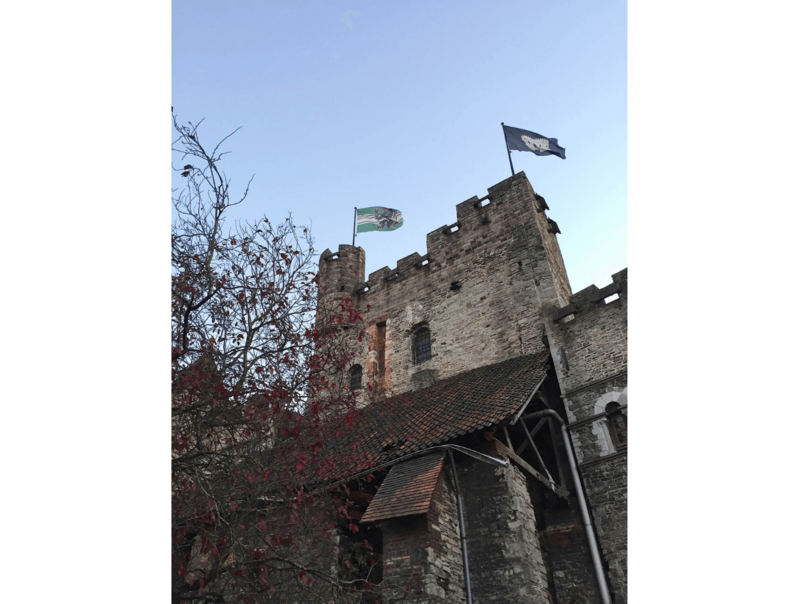 In 1949, Gravensteen the castle was occupied by a group of Ghent students who staged “The Battle of Gravensteen” to protest against the increase in beer prices. 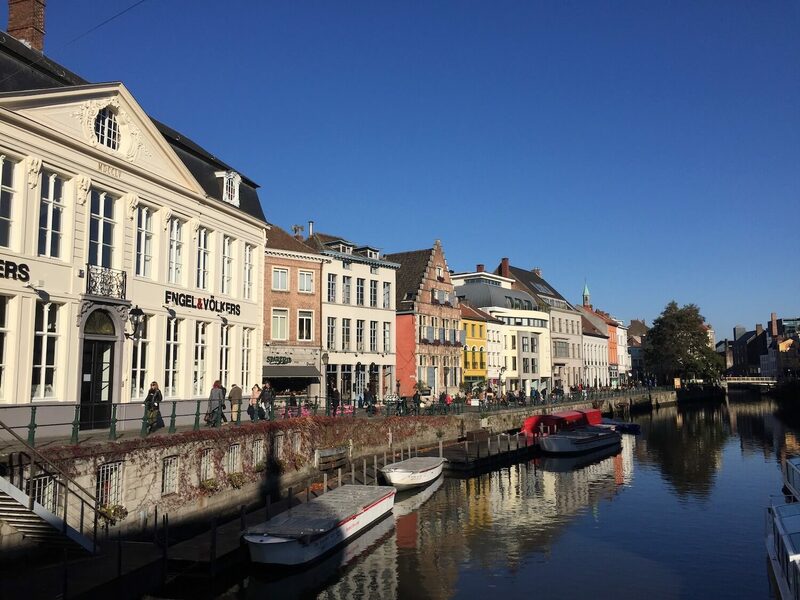 With such a huge student population desperate to have a drink, you would imagine Ghent offers quite a variety of places to hang out. And would be absolutely right. During my 3-day visit, I probably spent half of the time exploring Ghent’s numerous bars and cafes. Here’s my list of places you might want to check out, should you happen to be around. 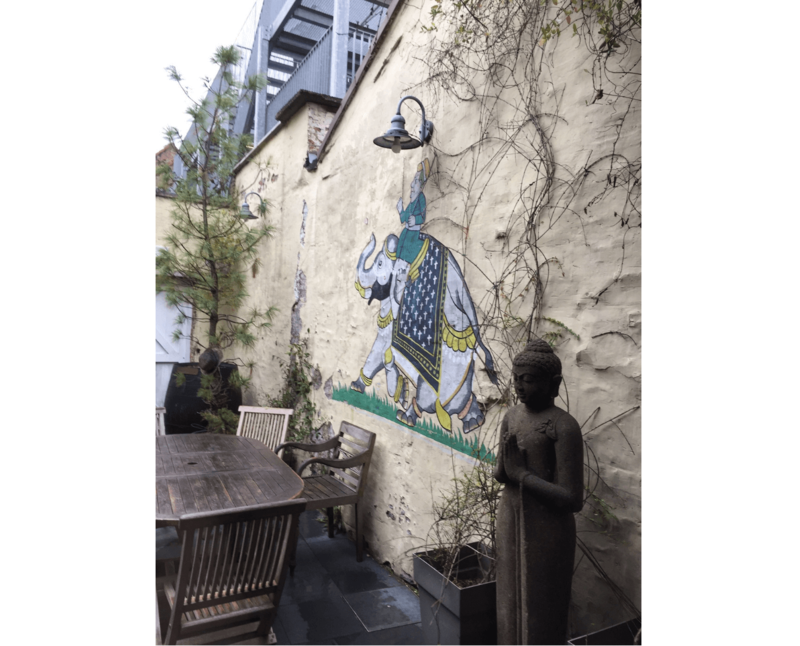 Whether you are just killing time before a concert or ready to party hard all night, here are a few venues to enjoy Belgian beer, wine, and atmosphere. (Kudos to my Gentse friend for reminding me about all the names. As after all the wine we drank, I would never be able to remember them). Marimain. 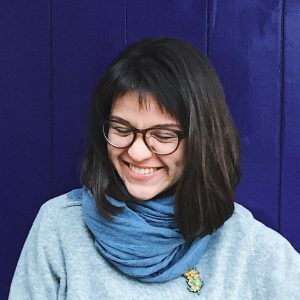 The name is a mix of Maire and her husband Romain Deconinck, a Flemish actor, singer and one of the founders of the famous Gentse Feesten, a 10-day city festival that takes place in summer. Het Zwarte Gat (the Black Hole). An “anarchist” bar frequented by students. Pretty gloomy and indigenous. Het Spijker (the Nail). An authentic bar right in the city center. As I was told, it has the best summer terrace (I guess I’ll have to come back in summer to check for myself 😉) The place gets very crowded with tourists and locals. Funny enough: there’s a bar right next door to it that tries to be as hip but never succeeds. Make sure to hit the right door! Manteca, a Spanish jazz bar. Sit by the bar counter and enjoy a glass of caipirinha or wine. Kapitein Cravate. One could easily spend the whole evening drinking beer and dancing to easy music. No, it’s not only waffles and French fries that you can feed off of while in Ghent. In fact, the city was even named Europe’s veggie capital, with its Donderdag Veggiedag (Thursday Veggie Day) tradition and a bunch of vegetarian options, like Tasty World. Mosquito Coast is a great choice for lunch and drinks. They also have the great staff that let me hang out for the whole day in the cafe and work quietly on the laptop. Take Five is an espresso bar that serves great regular coffee (although you might be looked down upon for asking filter coffee) as well as various coffee drinks and food. Make sure to check out the second floor that overlooks the street! So, here I am, FINALLY standing at the train station in Ghent. I need to take the tram to get to the city center. And then I realize I have no idea whatsoever where to buy a tram ticket. This is Europe, after all! They should have signs everywhere, written in big letters and possibly also in Braille! I return to the train station — in vain. I desperately walk around and ask the guys in a cafe where to buy the freaking tram ticket. “The machine is to the right from the entrance, right there”, they say. Sure enough, the machine is NOT there, and I am starting to get mad at the guys for the wrong directions — and at myself for not being able to find something so simple. This is Europe, after all! They should have signs everywhere, written in big letters and possibly also in Braille! Desperate, I come up to a cleaner who’s peacefully swiping the streets nearby and ask him if he knows where I can buy the tram ticket. You know what the guy did? Not only did he respond in (almost) fluent English but he also TOOK me to the machine, helped me buy the ticket, walked me to the tram stop and made sure I got on the tram safely. People in Ghent are lovely, fun, and very hospitable. To give you an idea of how much they cherish life: they light up the streetlights on Sint-Veerleplein when a child is born. I mean, how much nicer can it get? In addition to Faces on TV, there are Balthazar and the solo projects of its singers Warhaus and J. Bernardt. To make your cultural immersion more complete, make sure to check them all out! If you are only planning your first visit to Belgium or have already been before, make sure to dive into Ghent’s charming fairytale. Voorpret!